The HardMoves Boulderleague is the biggest bouldering competition worldwide, bringing together teams from bouldering and climbing gyms all across Europe every two years. After several months of qualifications the best teams eventually meet up in the SuperFinal at Wuppertal’s Historische Schwimmoper, competing against one another above water and in front of an exhilarated public audience. The HardMoves Boulderleague unites pro and amateur boulderers. The uniqueHardMoves format highlights the team’s achievement and not individual performances. During the qualifying round each participant gets the chance of attempting each qualifying problem regardless of their abilities and as often as they like. Top athletes thus work the problems shoulder to shoulder with recreational boulderers. The HardMoves Boulderleague culminates in the spectacular SuperFinal at the Historische Schwimmoper in Wuppertal. The HardMoves Boulderleague presents bouldering in its purest form. Top or flop – those who don’t make it take a dive … With its presentation, intoxicating music and light show, the comp’s staging is easily comprehensible and hugely entertaining for non-climbers as well. 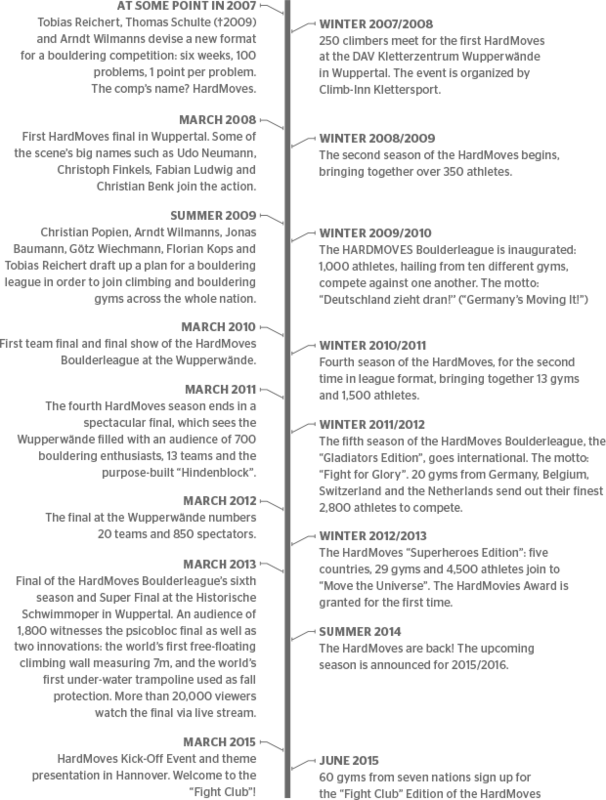 The HardMoves Boulderleague – that’s athletes, gym operators and insiders. Those who join the HardMoves don’t simply go bouldering; they live and breathe it and are absolutely passionate about all things bouldering. Accordingly, the HardMoves is no marketing concept but a product of this enthusiasm. The HardMoves are the scene, entirely authentic, 100% pure bouldering. Each HardMoves Boulderleague saison has its own theme, lending it a unique and unforgettable style. Winter 2007/2008 saw the first season of the HardMoves at the DAV Kletterzentrum Wupperwände. With some successful and well-established competitions in the area already – most notably Soulmoves, Rock & Jump and the Kölner Bouldernacht – climbers and boulderers Tobias Reichert, Thomas Schulte and Arndt Wilmanns were keen to devise a new format for a bouldering comp in Wuppertal. 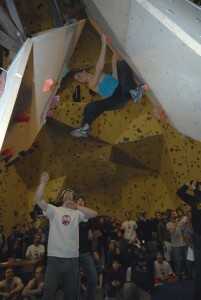 The HardMoves gave bouldering comps a fresh twist by giving athletes more time to qualify for the final. Instead of a single day, boulderers have six weeks to crimp, pinch and mantle themselves into one of the spots for the final. Within this period they can visit the gym and work on the problems as often as they like. Every problem sent earns them one point. In the end the top 100 lads and ladies made it into the final. More than 250 athletes joined the HardMoves fray in its inaugural 2007/2008 season. In May 2009 Thomas Schulte, until then one of the creative masterminds behind the HardMoves and chief route setter at the Wupperwände, died. During his many conversations with Arndt, Tobias and Christian, but also other gym operators and friends, such as Gregor Jäger (Kletterfabrik, Cologne), Thomas had frequently mentioned his idea of a bouldering or climbing league. In the summer of 2009 Christian spent several weeks climbing in Norway. During one of those long evenings spent chatting with Götz Wiechmann (Vertical World, Kassel) the idea of organising a joint bouldering event was born. Thanks to all the gyms that helped and help us on our road from vision to Boulderleague. Thanks also to Florian Kops, Friederike Kops, Boris Kühne, Gerhard Wust, Udo Neumann und many, many more for their support.